The answer is YES - and with Pedals too! The new 28-key Organ Pedal Booster hovers above a standard AGO pedalboard (with sides perpendicular to the floor), bringing the keys six inches closer to young feet. Its weight is suspended by two outer supports that rest on the floor, enabling the Booster keys to gently depress the host pedal keys with felt-tipped dowels. Spring tension for each key is still controlled by the host pedalboard as the Booster keys rest lightly on top. The entire Booster pedalboard adjusts up and down, and each dowel is also adjustable up-down, left-right to compensate for slight differences in host pedalboard dimensions. The Organ Pedal Booster has a red oak frame in an oak finish, with hard maple naturals and solid wood sharps. The strategy behind the Organ Pedal Booster is to make it practical for children to begin learning music at the organ from the very beginning (note reading, technique, improvisation, easy organ pieces and hymns, etc.). Charlie was our first student to use the Organ Pedal Booster. He was seven years old when he began music training as an organ student of Nora Hess. He plays "Italian Dance" in the video. 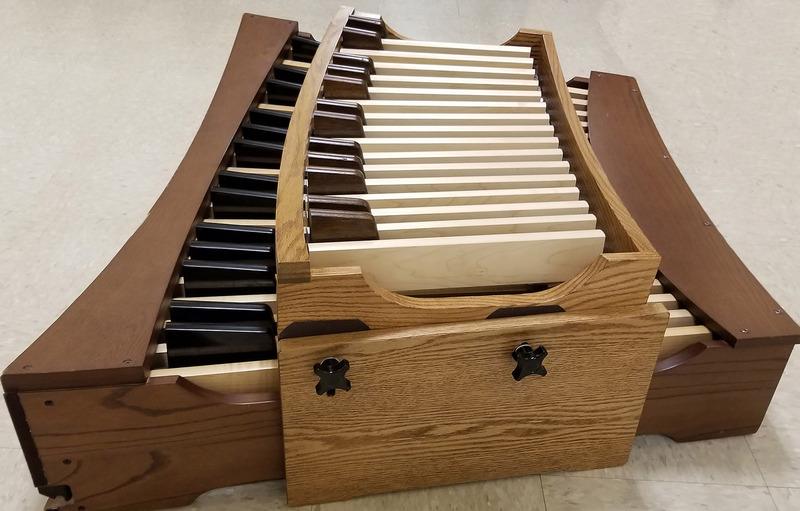 The Brigham Young University Organ Department (organ@byu.edu) has been using the Organ Pedal Booster with positive results since 2017. This fall they are introducing music to an Organ-First class of thirteen children in the BYU Organ Lab with Pedal Boosters. Order online and pay a nonrefundable $100 deposit. You will then receive an email invoice with the expected shipping date. Complete payment (cashier’s check received) prior to shipping. Schedule and pay for desired shipping arrangements. Ready to buy? Click here to pay nonrefundable $100 deposit.